How do I edit my character profiles? 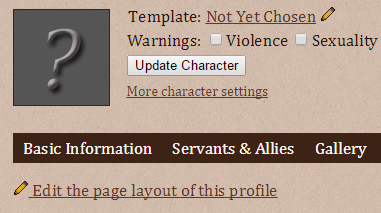 How do I add more pages to a character profile? Why can't I create any more characters? How many pages can a character profile have? How do I reorder widgets? How do I move a widget to another page? Click the big red "Create a Character" button. Your character is now created! You may now proceed to edit your character profile. Navigate to your Dashboard and click the pencil next to the name of the character that you'd like to edit. If you have not previously created any profile pages, you will be prompted to create your first page. Simply type in a name and hit the "Name first page" button to continue. Now you have a profile page! Let's customize it. Double click any widget to add it to the page. If you'd like more widget options, click the green buttons at the top to scroll through the different widget varieties. Once a widget has been added to the page, you can edit it by clicking the pencil in its title bar. Each type of widget will have different editing options, depending on what it's meant to do. Remember to click the widget's save button when you are done editing it! Each profile page can contain a maximum of 10 widgets. Browse through the selection of templates to find the one that you'd like to use, and then click the link "Use this template" to select it. After you have created your first character profile page, the process for creating more is slightly different. Click "Edit the page layout of this profile"
Then, click "Add a page." The prompt will ask you "Which column should this new page go into?" You may click any column. Clicking a column that already has a page(s) in it will result in the new page being added as part of a drop-down menu. Clicking an empty column will make it into a new top-level navigation link. Once you've selected a column, you will need to name your page. Type the name of the page into the textbox, and then click done. You may continue adding pages until you have as many as you'd like. Just remember to hit "Save changes" when you're all done! Browse through the selection of templates, and then click "Use this template" beneath the one that you want to use for this profile. Next to "Player:" choose "anonymous"
Type your character's tagline in the Tagline textbox. This will change how your character appears in search results. Please ensure your tagline is PG-13 appropriate. You've run out of space to store more characters! You can obtain extra character slots from items in our store. 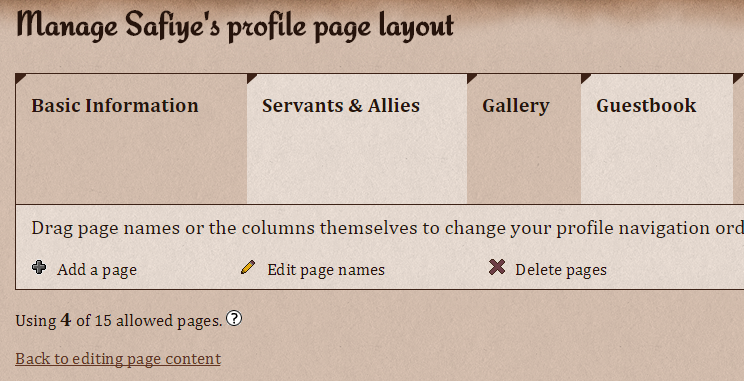 By default, you can create up to 5 custom profile pages on each of your character profiles. However, it is possible to gain up to 70 page slots for each of your characters by using an item in your inventory that grants page slots. You can purchase these items, receive them as gifts, or sometimes, win them in contests. Click and hold on the brown title bar of the widget, and then drag it where you want it. You don't need to do anything to save. Click and hold on the brown title bar of the widget, and then drag it to one of the page names. The delete button is a bit out of the way, to make certain no one accidentally clicks it. Click the pencil next to the character that you wish to get rid of. Look at the bottom right of the character management page for the red X. Confirm that you are certain you want to delete the character. You look really nice today. Are you doing something different with your hair?